Joan is a young teen living in Liverpool, England in 1941. The Germans seem to bomb sections of the city every night, and the other privations of war time are part of every day life. Joan's father, a wireless operator on an oil tanker, was killed when Joan was very young, but the family has gone on without him. Older sister Audrey is dating Dai, a young man in the service, brother Brian is helpful but somewhat annoying, and younger sister Judy needs a lot of care. Joan's mother is dating an "oily" soldier who is in charge of providing food for the local soldiers. Joan goes on lots of adventures with her friend Doreen, whose father is fairly well-to-do and well connected. When a Polish refugee, Ania, joins Joan's school, some of the other students are not particularly kind. When a mysterious man who has been hanging around Joan's neighborhood identifies himself, Joan's family gets pulled into some intrigue involving him, and there is also some black marketeering being run by some surprising individuals. Strengths: Ms. Hughes was born in 1927, so she is able to include many details of this time period that people who had not lived through it would never know. Audrey attempting to use gravy brown for leg makeup was a detail that blew me away! While I am not a huge fan of "home front" stories, there is a 7th grade unit on historical fiction from 1940-1980, and this will be perfect for that. Also, Liverpool is one of my favorite cities (and somewhere I don't get lost easily), and I've been enjoying some of the BBC period dramas such as Home Fires and My Mother and Other Strangers, so I will definitely be recommending this. Weaknesses: A bit light on plot, but the details of daily life more than make up for it. What I really think: Hero on a Bicycle does very well in my library, so I'm glad to purchase this one. I will also be looking into Ms. Hughes' work-- she seems much more well known in the UK. Addison is chafing to be off on another adventure now that school is over (and he's managed to avoid detention), and is glad that Aunt Delia and Uncle Nigel are willing to let him take Eddie and Raj to the Gobi desert when the museum sends them off China. They meet with Eustace Hawtrey in Hong Kong, but before Addison can soil his new white dinner jacket, his aunt and uncle are kidnapped by Madame Feng and her band of Triad gang members. It turns out that a shield Hawtry showed the group has directions to the tomb of Ghengis Khan, and Madame Feng really wants to have the fabled Golden Whip. 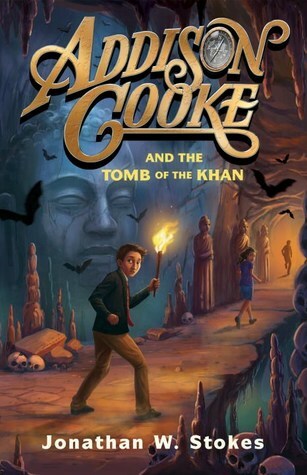 Soon, Addison and friends are whisking themselves off to Macau to Feng's casino; finding Dax, a pilot his uncle trusts who takes them into the Gobi dessert; and bartering with camel merchants who miraculously speak English in order to obtain camels to take them to where they suspect the tomb is. Along the way they are followed by Triad gang members, catch glances of poor Aunt Delia and Uncle Nigel, and manage to find the Golden Whip-- only to lose it. The book finishes with Molly and Addison meeting their Uncle Jasper and finding out a few more clues to the family mystery and the prophecy that indicates that all of the Cookes must die! Strengths: Like Addison Cooke and the Treasure of the Incas, this is a fast paced, appealing adventure romp that is fantastic once you suspend your disbelief about Addison's ability to travel and to fight off die hard Chinese gang members. At 450+ pages, it will keep avid readers occupied for a day or two. The inclusion of information about Ghenghis Khan, who is covered in the 6th grade social studies curriculum, is an added bonus. Weaknesses: I read this while having an extreme attack of Middle Age ennui, so I couldn't personally get into this. I didn't care about the Golden Whip and found it unlikely that Madame Feng would, I was irritated by Addison and his white jacket, and the whole thing seemed improbable. I wondered why Dax would fly a sketchy plane with a toothpick in his mouth. Forget the Triad members. Dax impaling his esophagus seemed more of a threat to me. This will not matter to the target demographic at all, and Addison's quirks are much tamer than they were in the first book. What I really think: I will definitely purchase a copy for my fans of Ryan Quinn, The Devil's Breath and Stormbreaker, and the ARC will get handed to about three different eager reader when I go into work tomorrow! It's good to hear about both books, and I imagine kids will like the 2nd one with the adventure. I have Whistling In The Dark, need to read it. It sounds interesting. Thanks, Karen. I love the way you formatted your reviews -- reading about you honestly talking about the weaknesses of the book along with the strengths made reading this review really enjoyable. The second book sounds so interesting, and since I love Hong Kong and everything to do with Chinese culture, it seems like a book I'll like :) Thanks for the reviews! I hadn't heard of either of these books, so thank you so much for introducing me to them. 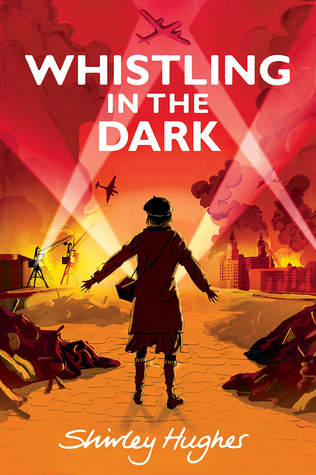 I love Hughes' picture books,Whistling in the Dark sounds like a winner. I've become a fan of these British series as well. I was sad to get to the end of The Bletchley Circle and enjoyed the first season of The Land Girls. I'm going to check out Home Fires and My Mother and Other Strangers.